To meet the diverse requirements of our clients, we are engaged in offering a wide range of Neem Pencils. Neem pen- neem pen are made from the twig of the neem tree. You can write off many diseases by using these pencil. Its also help to remove disease like tiredness, cough, fever. Also called as "Eco-pencils .The Neem Pencils are 100% eco friendly, anti-bacterial, non-toxic and are made of neem twig obtained from northern part of India. 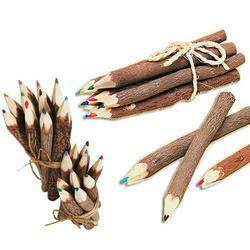 These pencils are also popularly known as Herbal Pencils. We are one of the leading manufacturers and exporters of high quality Neem Pencil. We have marked a remarkable position in the market by offering the best quality array of Neem Pencil. 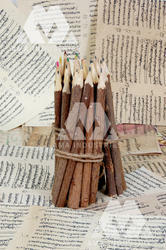 We are engaged in producing wide collection of Handcrafted Neem Twig Colored Pencils. These pencils are eco-friendly, anti-bacterial, non-toxic and are a perfect gift item and unique as well. Our range of neem colored pencils is available in various sizes and designs. Further, these are appreciated for their classic design, fine finish, durability and reasonable rates, etc. We are leading best quality of Neem Pencils.